Kylah McCombs finds her life turned completely upside down when her overwhelmingly handsome neighbor manages to get control of the water rights to her ranch. Michael Beasty has no intention of cutting off the water supply to the McCombs ranch, but he can’t tell Kylah until he figures out how to resolve the issues that threaten his own ranch. 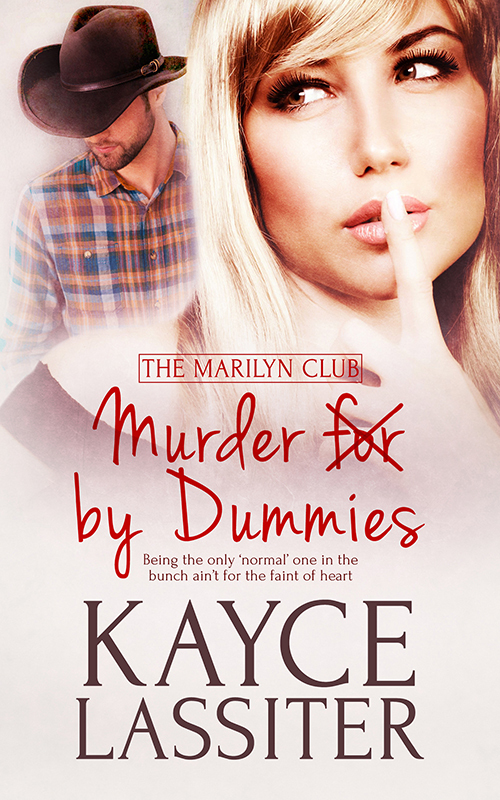 So when Kylah’s redneck fairy god mother shows up on a Harley to save the day, she convinces Michael to hire Kylah as his housekeeper and give her a way to buy back her water rights. Michael needs a housekeeper desperately, but isn’t sure he can hold out against the snarky flaxen haired beauty that has moved into his house and his heart. Will Kylah and Michael find a way to save both ranches? Will they destroy each other in the meantime? Who is the strange woman on the motorcycle that has shown up in their darkest hour with the mangiest dog on the planet? What does she want and why won’t she go away? Second book I’ve read by this author. Couldn’t put the book down once I started. She makes you feel as though you are right there. Woo Hoo…books and martinis this weekend!!! Hi y’all…how’s everyone doing this good Friday morning? Hope everyone is wonderful, fabulous, and outrageous and that you all have a big, fun weekend planned! What am I doing? Ooooohhh, so glad you asked! This is what I’m doing…I’m signing my books at the Arizona’s Ultimate Women’s EXPO, which is being held at the Phoenix Convention Center in downtown Phoenix this Saturday and Sunday. They have some fabulous products and services that will be on display, in addition to an all-star cast of keynote speakers. So run….don’t walk…ride a bike, ride a bus, ride a donkey…but get there! Shhhhh….it’s a secret…rumor has it there will be a MARTINI BOOTH! Now, that’s something I can really get behind!!! And…if that’s not enough…I will be signing there right alongside our very own H.D.Thomson and 5 other fabulous authors: Lizzie Bella, Carolyn Hughey/K.T.Roberts, Taylor Michaels, Arabella Thorne, and Tami Vinson. So pack the kiddies off to the babysitter, grab your car keys (or your donkey bridle), and come join us for some super fun. Now where is that map…I have to know the exact location of that martini booth! That’s my story, fun and fabulous, and I’m stickin’ to it! So hang on real tight now, ‘cuz we’re gonna go real, real fast! There are two kinds of matches in life—the kind humans make on their own, which succeed or fail depending on how much work they put into the relationship, and the “made in Heaven” kind that are especially blessed to last a lifetime. Matches made in Heaven are the fulfillment of a special blessing the creator has bestowed on a family line because of some great service or noble deed performed by an ancestor. These matches are heralded by the appearance of a glimmer, the spirit of an unborn child, to the mother’s godparent. The glimmers come to the godparent in the form of an aura attached to the collar of a dog that’s destined to remain with the family to look after the child. It’s the godparent’s responsibility to ensure the match is made before the glimmer fades and dies, taking with it the promise of true love and happily-ever-after. Fairy Godmother, Delta Jane, is tasked with making a heaven-sent match for Shannon Burnett before the spirit of the child she is destined to have fades out of existence. Shannon, however, has a serious dilemma. 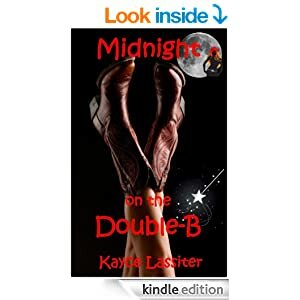 She is attracted to two men—Michael Tanner who seems to be “another undependable cowboy”, and her high school boyfriend Jackson Miller who seems anxious to pick up where they left off twelve years before. It’s going to take all the resources and creativity Delta can muster to help Shannon grow beyond her past hurts to see these men for who they really are and make the right choice. 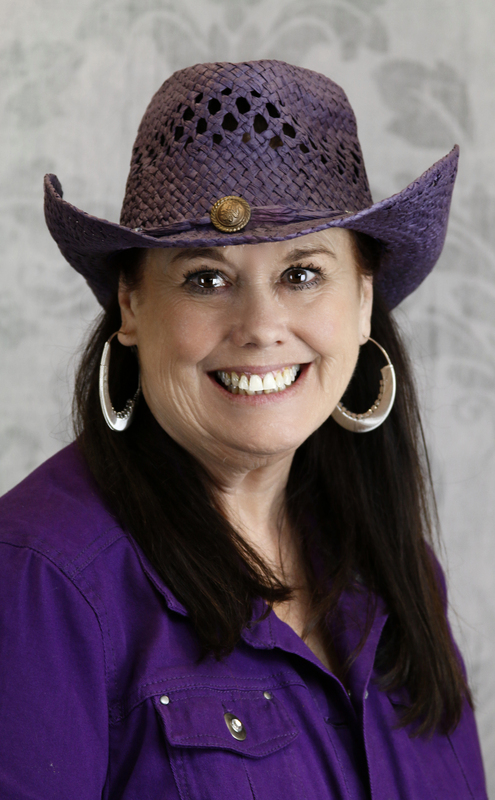 Will Shannon resolve her anger with her cowboy father? Is rancher Michael Tanner cut from the same cloth? Is Jackson Miller a better choice? Who will Shannon choose? Will Delta Jane make the match before the glimmer is gone forever? Hold on to your hats (or rather your helmets)! 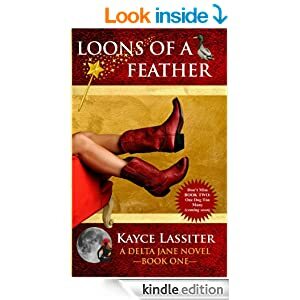 Kayce Lassiter has done something no one else has done…..in her book, Loons of a Feather, she has gifted us with Delta Jane, the hippest, most color-coordinated, craziest fairy godmother the world has ever known. And thank goodness! Delta Jane’s job is to bring people together so they can fall in love, if she can keep her brother, fairy godfather in training Bubba, from casting his own spells, which never seem to turn out right. In Loons of a Feather, which I loved (and you will, too), it’s Delta Jane’s job to bring together Shannon and Michael, two people who are obviously made for each other despite the various ups and downs of previous relationships and the fear of giving one’s heart once more. Loons of a Feather was a joy to read…I only wish I had a Delta Jane in my life. And I look forward to reading more stories about Ms. Lassiter’s feisty, spunky motorcycle-riding fairy godmother! 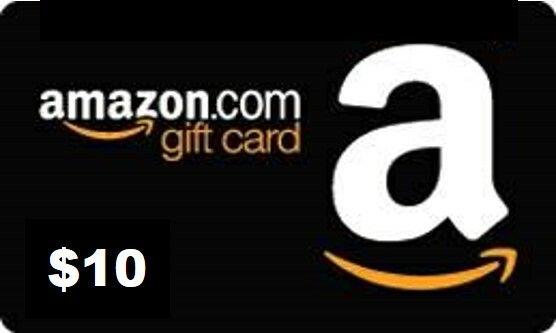 Rev your engines and come join the fun!